The ability to retire with dignity is under further attack. This is part of the 40-year assault on the economic security of workers in the US and throughout the world. With millions of workers reaching retirement age, these problems are beginning to explode. Wages and benefits have been under attack for decades. Frequently, these attacks were framed as a temporary setback: “a little sacrifice now will allow us to build a stronger economy for everyone in the future” – a variant on trickle-down economics: make the rich richer now, and their financial wizardry will make millionaires of all of us down the road. Underlying this deception was the idea that each worker’s sacrifice was only “temporary”. Survive until retirement, so the story went, and you’ll be ok in your “golden years”. That was the dream. But while workers worked harder for less, Congress enabled private employers to transform most “defined pension plans” into savings accounts which could then gambled on the stock exchange. Defined benefit plans means that the amount of monthly retirement income was guaranteed. The percentage of private sector workers getting defined benefit pensions plummeted from 62% in 1979 to a pitiful 7% in 2009. Today, less than half of US workers have any kind of pension plan other than Social Security, which itself is under attack and covers only about 40 percent of what a person needs to retire on. Also, fifty percent of workers have less than $10,000 dollars in savings. In the private sector, most non-union employers simply stopped paying into existing defined benefit funds and switched to 401K’s or other investment schemes. Multi-employer pension funds, often won through labor unions, have been seriously eroded by deregulation and employers dropping out through. Late in 2014, major corporations including UPS and Kroger lobbied successfully for a new Federal law, tacked on at the last minute to the 2015 Federal omnibus appropriations bill. This legislation allows a multiemployer pension fund which is projected to run out of money in 15 to 20 years, to cut benefits to existing retirees. In some instances the cuts could be more than 60%. The Central States Pension Fund which covers hundreds of thousands of Teamsters is now using this reactionary law to threaten massive cuts to the benefits of existing retirees which coule lead to people losing their homes, not being able to pay for medicine or to support their families. Central States pensioners are organizing to fight back, and Senator Bernie Sanders and Congresswoman Marcy Kaptur of Ohio have submitted a bill that would rescue this and similar funds through tax increases on the wealthy. Public sector pensions were theoretically protected by various laws that unions fought for on a state by state basis. But they were eroded in a different way: while most public sector workers made pension payments out of every paycheck, governments that were cutting taxes on the rich “borrowed” from these funds to pay for other things – including handouts to big business. Both political parties participated fully in this process, which has now developed into a full blown crisis of underfunding. The situation in Greece gives us a hint of what can lie ahead if we don’t build an effective resistance. Pensions have already been cut since 2010, on a scale ranging from a 15% cut for those getting the very lowest pensions (under €500 a month) to as bad as 44% for the highest (more than €3,000) so that today, 45% of Greek pensioners are already below the poverty line. And with a jobless rate of about 26% (50% for youth), pensions are now the main source of income for almost half of Greek families. The US Commonwealth of Puerto Rico owes $72 billion to Wall Street. Additionally, its public employee pension fund, with an estimated $30 billion shortfall is set to go broke in five years. In New Jersey, Republican Governor Chris Christie’s budget, with bipartisan support, cut $1.57 billion dollars from the state’s public pension and benefit system. 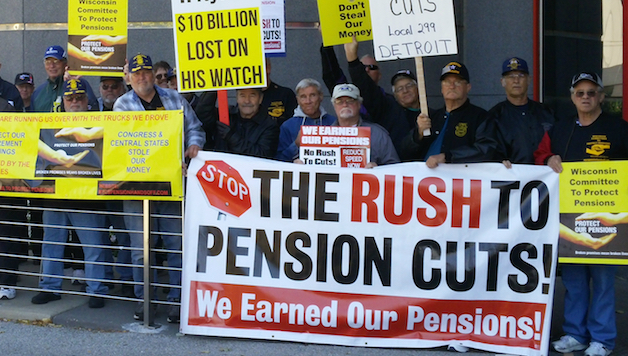 Illinois has the most underfunded pension system in the country. The main State employee system is funded at around 40% of future needs and the shortfall is now at an eye-popping $100 billion. Yet, transactions on the Chicago Mercantile Exchange (CME), Chicago Board of Trade (CBOT) and Chicago Board of Options Exchange (CBOE) generate $900 Trillion each year. A tax of $1-$2 per transaction would raise over $10 Billion annually, abolishing both City and State budget crises. Sparked by left wing activists and publicized by Chicago Teachers Union President Karen Lewis, a movement is building around this demand but is at present led mainly by social movements. The unions need to embrace this movement. The CTU which stood up to Rahm Emmanuel, Mayor 1% when they went on strike in 2012 could play a decisive role in galvanizing opposition. Bernie Sanders is galvanizing huge support with a platform of no cuts, a $15 minimum wage, free college education, increasing social security benefits and a massive jobs programs to be paid for by taxing the rich. By linking up ongoing social movements with a fight to preserve pensions and social programs – and raising the demand that all workers have the right to a decent pension – labor unions could not only help build a powerful fightback, but also help rebuild a fighting labor movement.